I’m so excited about today’s post! 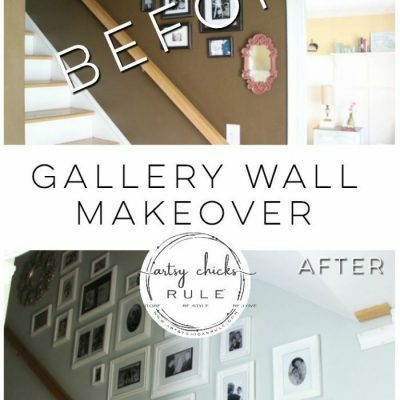 This one is right up my alley….budget friendly decor. 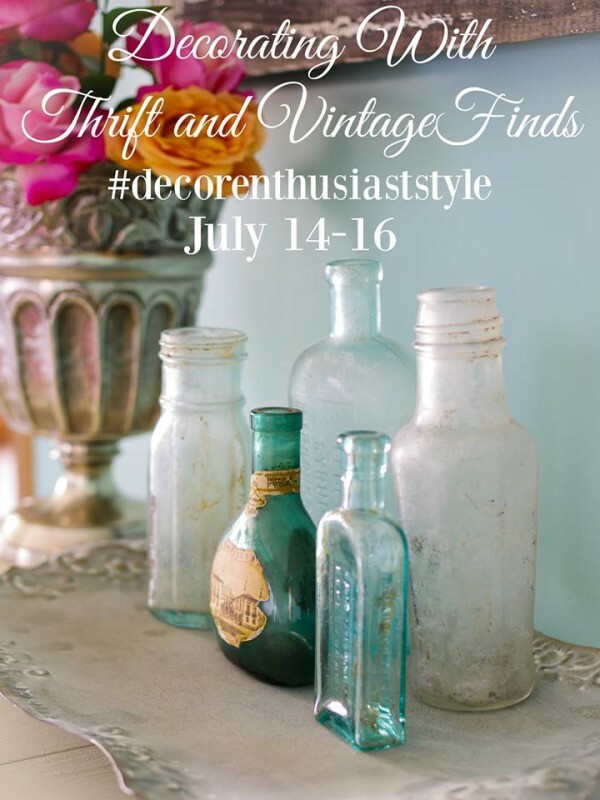 My decorating friends and I will all be sharing a bit of vintage and thrifted finds in our decor this month. 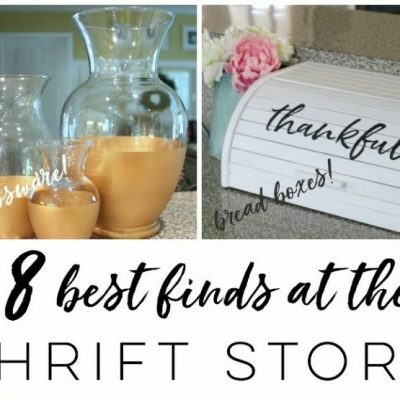 So, since I have so many thrifted and vintage items already (my entire house! ;) ), I thought I’d share some of my favorites with you all. 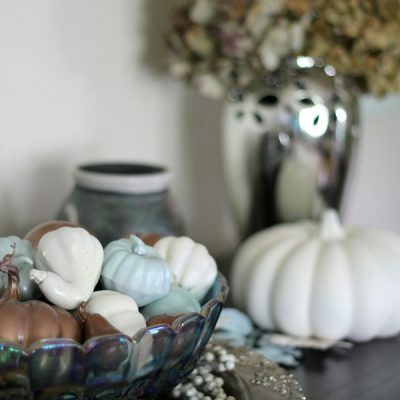 AND…share how you can create budget friendly decor too! 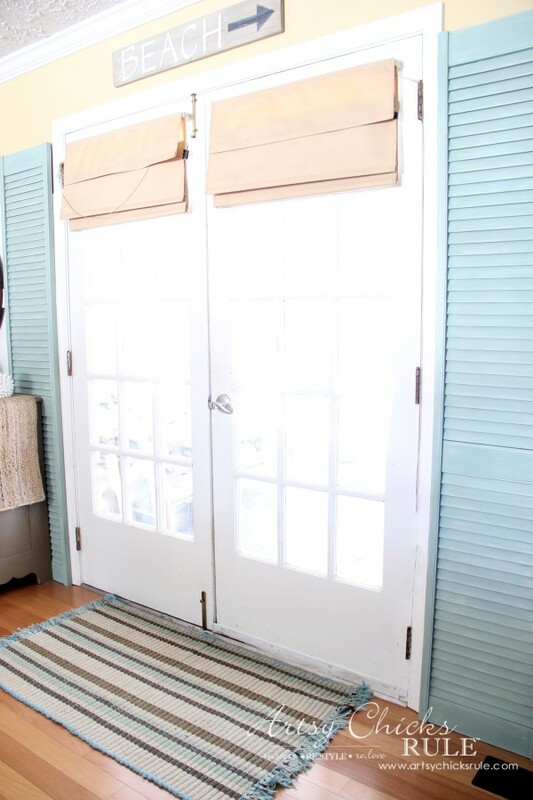 First up, 2 of my very favorite (which are about to undergo a makeover as well)….”shutters”. 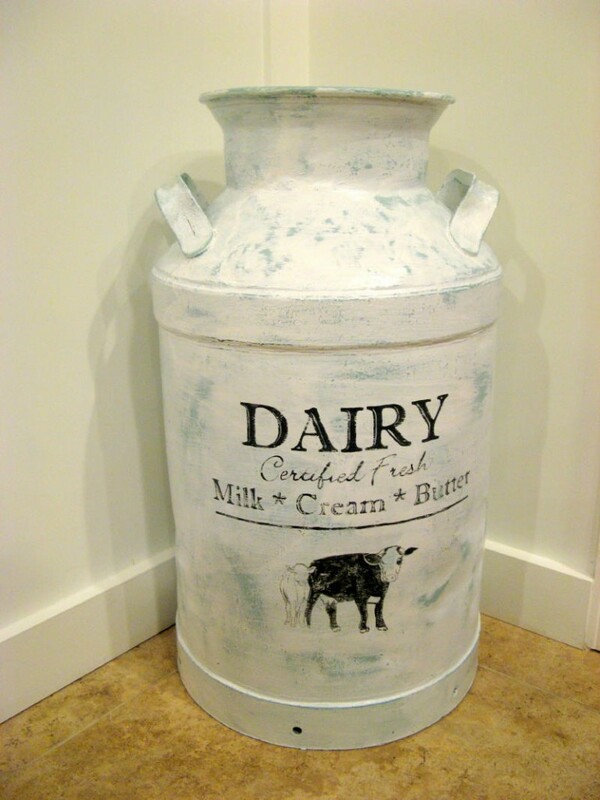 Another of my favorite thrift store finds…..this old milk can. 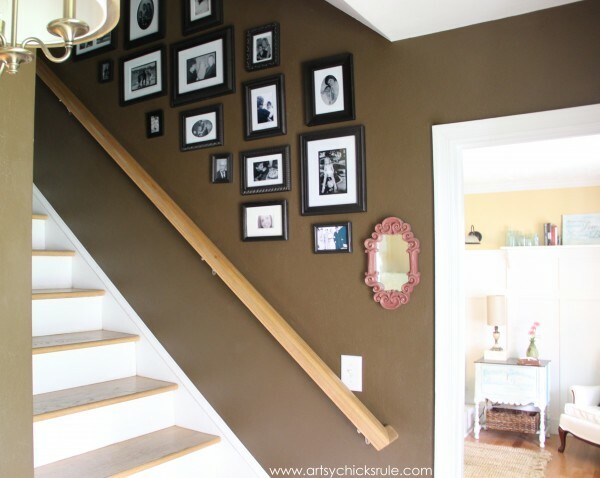 My stairwell gallery wall created for less than $20 using thrifted frames and mats. 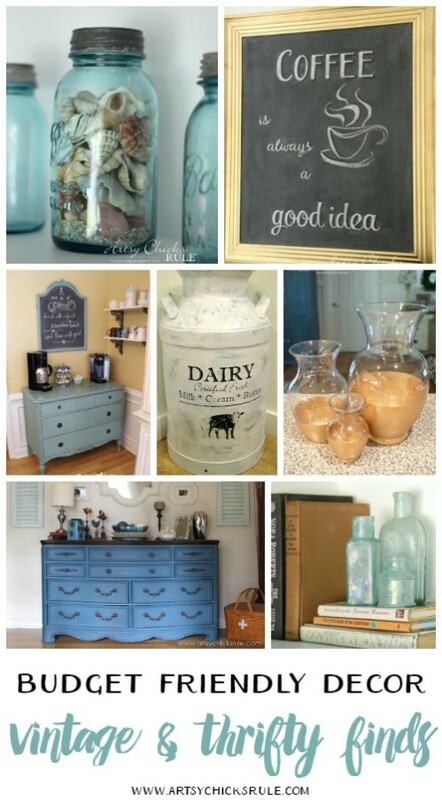 My loves….Blue Ball Mason Jars. I don’t care if these have supposedly “gone out of style” again….I will love them til forever! 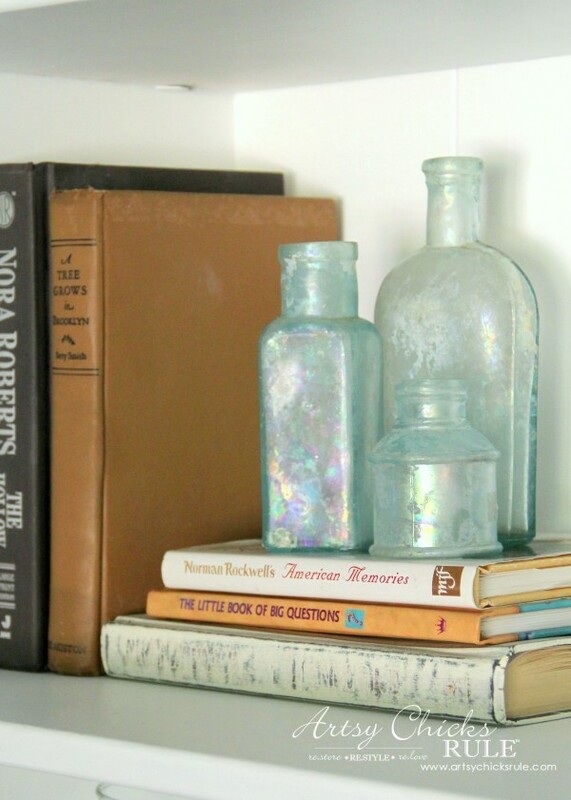 And these blue bottles and old books too….. 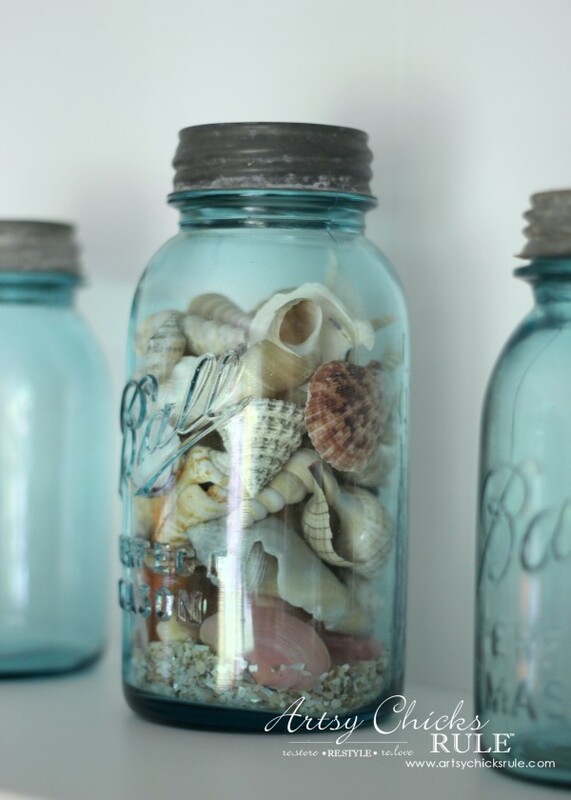 These .25 cent jars….perfect for painting and decorating with. 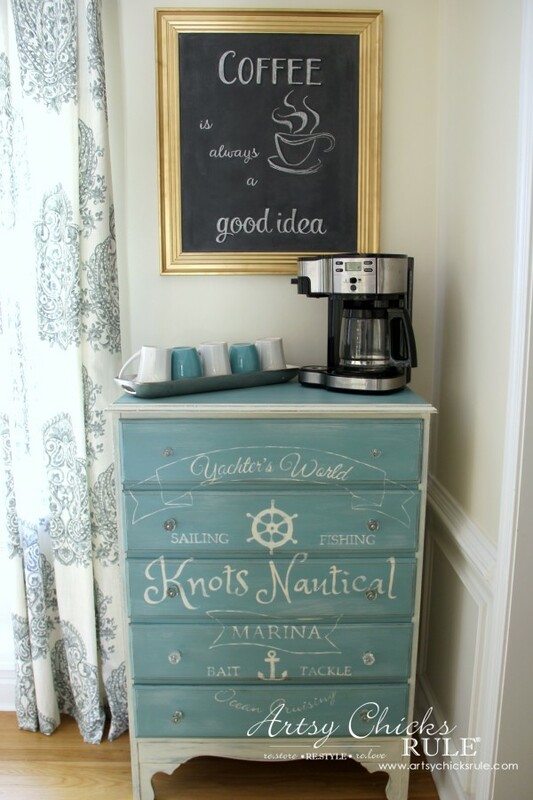 And of course, my coffee bar! I so enjoyed this coffee bar. I found it at the thrift store too (for cheap!). 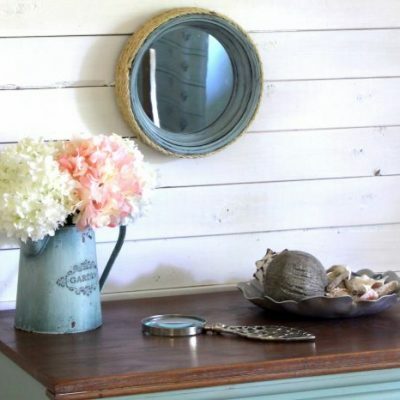 Many of the items on top of this dresser…..
….and the shutters on each side of the gallery wall too. 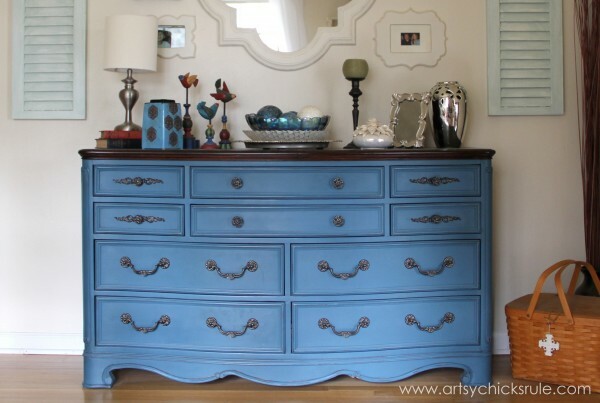 Plus the gorgeous blue dresser is, as well. 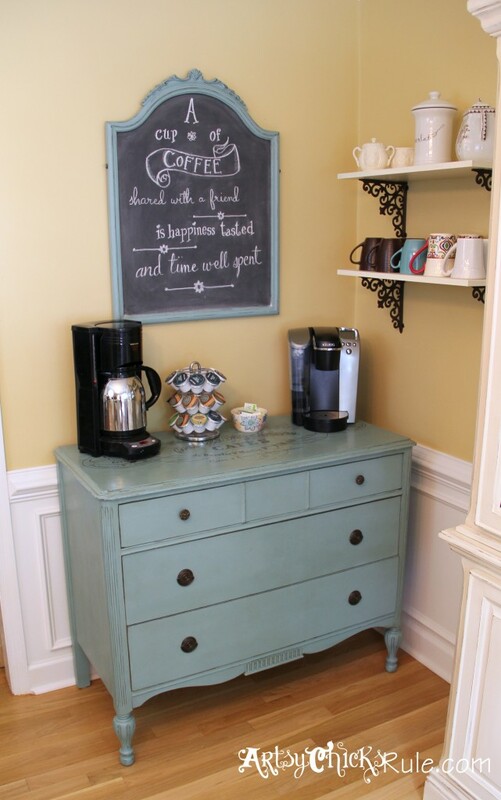 Even my newest “coffee bar” is thrifted…..
….as well as the “print turned chalkboard” and coffee mugs. The chest came from one of my favorite thrift stores. Ninety percent of everything you see on those shelves was found at the thrift store or a garage sale. See the blue, antique fan on the right? I found that one at a garage sale recently. 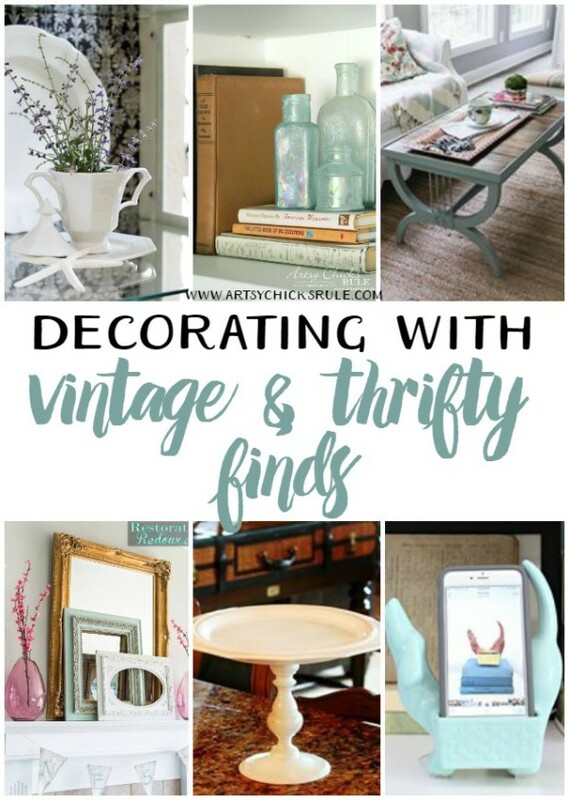 Now let’s pop on over to see what my friends are doing with their vintage and thrifted decor! 1. Add your own photo on Instagram starting today (7/14) through Saturday. 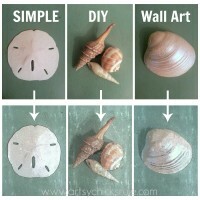 I hope you enjoyed seeing how you can decorate your home, and create lovely decor, on a budget. I have so much more, in many of my rooms, that I didn’t even share here. 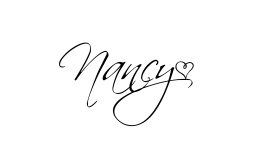 I love finding thrifty pieces Nancy, you have certainly found lots of treasures and made them beautiful. Fun to see them all posted together! Oh yes, isn’t it so much fun?! Thanks Sandra! I am loving the shutters! So much goodness here today. Thanks for posting all of this! Can you come help me with my shelves they are a hot mess! 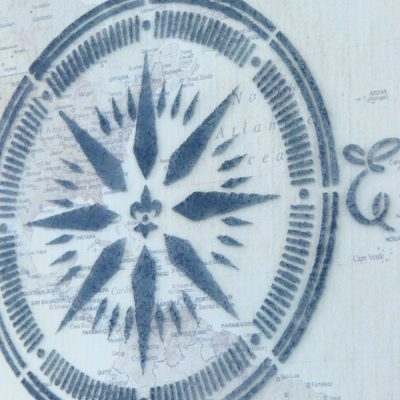 You have such a way with thrift store decor! Love how you transform even the simplest of accessories! 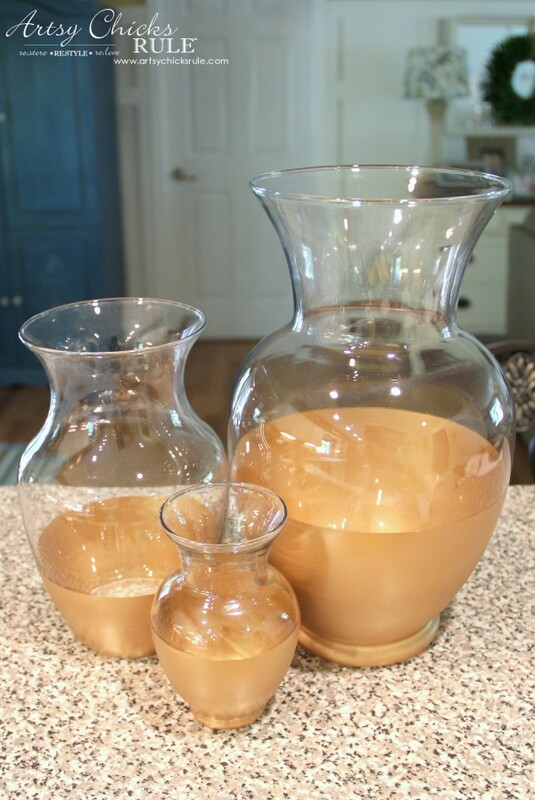 I still remember your fabulous tip about getting those straight paint lines on bottles and vases. No more struggling with painters tape for this girl ever since! 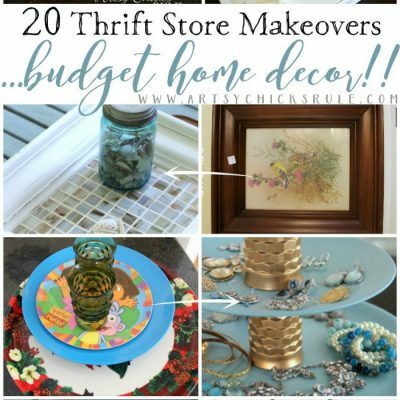 I remember most of these awesome thrift store makeovers, Nancy, especially your coffee bar as it was one of the first I ever saw. 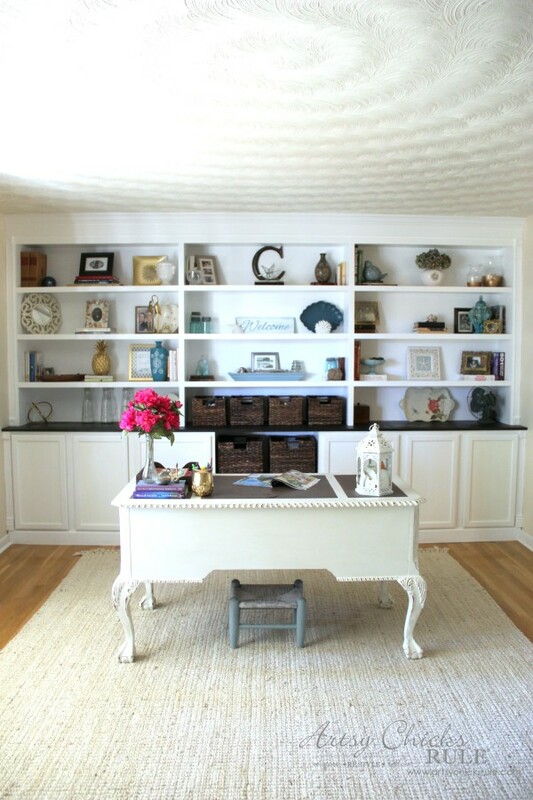 Still swooning over your den space – those built-ins…that desk? I really would love your advise. My husband and I painted our kitchen cabinets with chalk paint, distressed them and added some dark wax for more definition. They look great but I cannot get rid of the brush strokes! I applied 3 coats of paint and the third coat I added water to the brush to cut down on the strokes but they are still there… I have applied poly to the cabinets but will go back and do more work to get rid of the strokes. Any advice? They look nice but I don’t want them to look like two amateurs painted them. LOL apparently we are!! 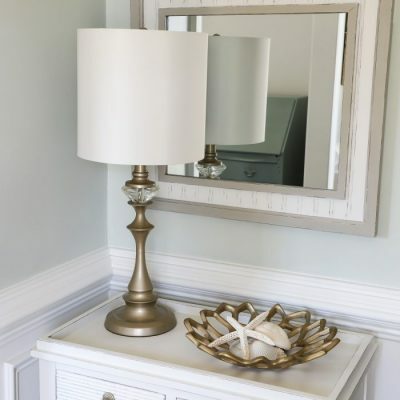 Typically, the best way to get rid of paint lines is to thin the paint a bit at the get-go, use a good quality paint brush and light handed strokes. Or you could use a paint roller. Sanding with very fine sand paper in between coats is also helpful. For a painted finish, that is finished (with several coats of paint, etc) it will be a bit harder to remove the paint brush strokes. You will most likely have to sand down quite a bit and go again. I am curious about the application as you stated…did you apply dark wax and then apply a poly coat over top of that? Polys typically do not adhere to wax. I worry about longevity of the finish if you did indeed apply poly over wax. If you did, you may want to sand down a bit anyway and either apply wax OR poly as your finish coat, not both. If you sanded in between paint coats, it sounds like maybe the brush marks are coming from the final poly coat then? If so, maybe try a light sanding, cleaning and then applying another coat of poly. BUT this time apply it with a cabinet roller instead of a brush. That should give you more of the finish you are after. I don’t think you need to start completely over. Try doing as I stated above on one door and see what you think first. I love your blog wish I could get to the point where I can do what you do!!! I will let you know how my cabinets turn out and if I have issues down the road with the poly and the wax. Where did you get those jars they would be a great for me to put all my shells in. Oh goodness, I have picked them up all over, over the years. Antique shops, garage sales, markets, etc.